Our 54' Flying cloud that we love! Central Oregon Daily's "Origin Stories" Television Series special on Our Story. 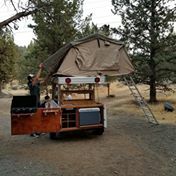 My journey to helping people fulfill their dreams through vintage trailer restoration could best be described as a continuous rollercoaster full of twists and turns that ultimately led me to finding my true passion in life. In my family, my older 7 siblings and I all came from a long line of contractors involved in all phases of construction including underground utilities, engineering, project management, home building, interior design, and woodworking, just to name a few. My father was in construction and growing up, not only would he have me help him on his job sites, but he also had a 1300 sq. ft. shop right outside our home, where he helped develop my welding and metal working skills. To complete my skill set, I worked construction for 15 years starting in high school – this experience in addition to my father’s teachings allowed me to develop the abilities necessary to complete projects with the knowledge and quality that SamSon’s promotes today. Eventually I moved to Bend in 2000, but I didn’t find out what my passion in life was until I worked as an emergency medical technician (EMT)/fire fighter with a local fire department. I was given the opportunity to work with amazing people and found that my true passion in life was helping people simply in need of a smile. I knew I wanted to go even further, so I began working in the emergency department (ED) as an EMT where I was able to help people on their worst days, and just maybe be the one person that made them smile that day. However, it was the toughest situations in the emergency department that showed me the most - physically having people live and die right under my hands. People would ask how I dealt with that type of work and my explanation always gave me more insight about my passion - I did not cause these tragedies, but I was there to help them get through the best that I could; the amazing people that were also a part of our team at St. Charles always gave them the best chance of survival, but sometimes it was just out of our control. I knew I needed to be helping people in a more diagnostic/prognostic way, so I set my sights on getting into graduate school to be a Physician Assistant (PA). After enrolling in Oregon State University Cascades Campus in 2010, I continued to pursue a Biological Health Sciences degree full time while continuing to work in the ED as well as working at the most local restaurant there is, The Pine Tavern, as a server. The restaurant gave me the opportunity to work with guests and hone my communication and customer service skills that made the dinner guests smile or even laugh. After meeting my now my amazing wife, whom is a clinical pharmacist in 2014, I graduated with my bachelor’s degree in 2015 and began to apply to PA schools around the nation. Unfortunately, PA school is very competitive with some programs only accepting 45 students per year and receiving sometimes over 2500 applications. I endured the pure disappointment of not getting into graduate school and felt like my dream job slipped away from me. I even applied to a graduate school in public health because I knew that I had to pursue a career that helped people in some way (I am currently still a full-time student and graduate with my master’s degree in Public Health this July). I was lost and didn’t know which direction I wanted to take my professional career. However, with my Biological Health Sciences degree I was able to get a job as a chemist right after graduation where I developed scientific testing methods and standard operating procedures. I ultimately used these skills I acquired to work in quality control as an analytical chemist in pharmaceutical manufacturing, where unfortunately I still became very lost, unhappy, and unfulfilled with my professional career. Towards the end of my time as an analytical chemist is where my story here at SamSon’s begins! Things began to get much harder for me when I received news of both a cancer scare and the death of my father. This past year, I had been having some stomach issues for months that I ultimately had to see a gastrointestinal specialist for. A diagnostic exam had revealed 2 precancerous polyps, which were removed, but if I had waited until the recommended age of 50 years old, it could very well have been too late for me. Within a week of discovering the polyps, my father passed away while I was on the phone with him. Right before he died, I’ll never forget him telling me “Jason, take this as a second chance at living life to the fullest” and it has stuck with me ever since. After he passed, my mom and I took the time to go through a lot of his possessions – my dad was notorious for hoarding more tools than he knew what to do with or use. Most of them brought back some great memories of my dad and I working in his shop or when my dad and I built our house together. I didn’t know why, but I felt a strong connection to them and felt like I could use them; I ended up taking all of his tools. My fiancé and I had our wedding coming up, so to save money on trips up to Washington to see my family during this difficult time, we decided to purchase a travel trailer for a cheaper price, fix it up, and then sell it before the wedding day to make a profit and pay for wedding expenses. It was the project that inspired everything. Looking back, I know now that making someone’s day has always been my passion and that it doesn’t matter in which capacity I get to do it. It is just a bonus that I get to go to work every day and enjoy life to the fullest and do what my passion is and enjoy my second chance at life.